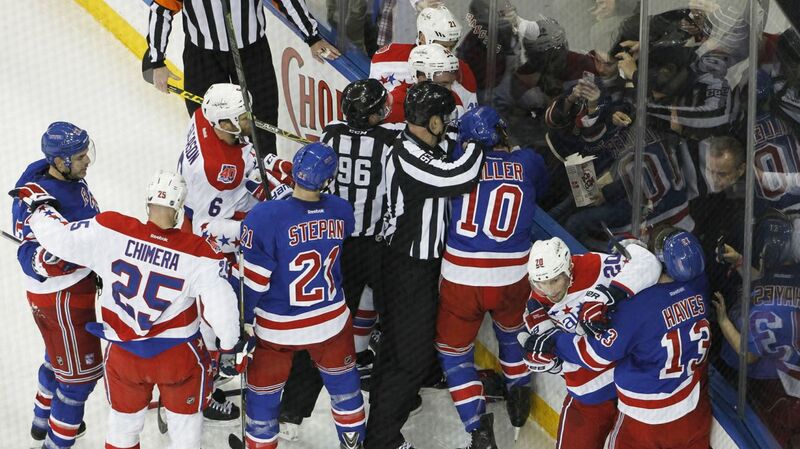 The Rangers and Capitals will meet again for Game 4 tonight, essentially a must win for the Rangers. They’ll need to combat the Capitals size and smothering defense, and score some goals. Photo courtesy of MSG Photos. At 7:30 PM tonight at the Verizon Center, the Rangers will be playing their most important game of the season to this point, looking to even the series at two before heading back to Madison Square Garden for a pivotal Game 5. 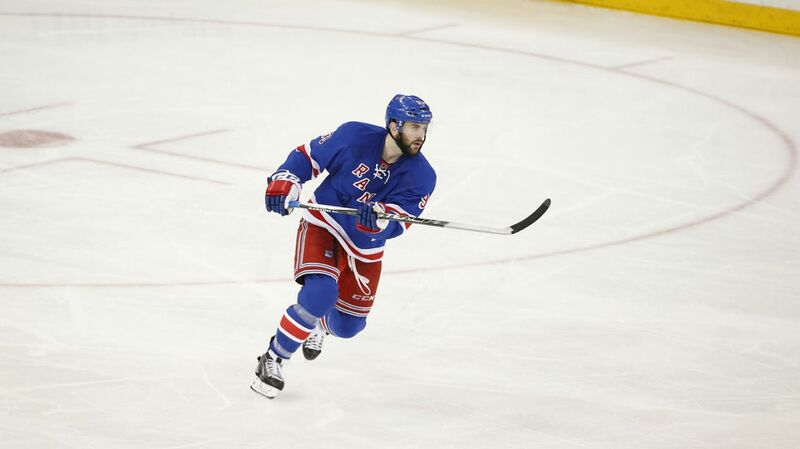 Trailing the series 2-1, the Rangers would be in an extremely precarious situation should they lose in Game 4. This is the situation they are in after getting shutout in Game 3, with their offense struggling mightily throughout the first eight games of the playoffs. After averaging over three goals per game in the regular season, the Rangers have found that number dip to just 1.88 in the playoffs, scoring just four goals in the first three games against the Capitals. Players like Rick Nash, Martin St. Louis and Derek Stepan have struggled to consistently provide offense for the Rangers, which is a big part of the reason why they are struggling against Washington. During practice, Vigneault also pulled Keith Yandle aside for a private conversation on the ice. When asked about it, Vigneault said that it’s a hockey conversation that will stay between him and the player, but not atypical. It’s likely that he was talking to Yandle about his lack of production lately. The Rangers supposed best offensive defenseman has just two assists in eight games, and no points on the power play. He’s been largely indecisive and inconsistent, and hasn’t allowed the offense to flow through him. Keith Yandle needs to do a lot more from the blue line. The price of acquisition was high for him, and he hasn’t delivered in the playoffs. The power play is struggling, Yandle is indecisive with his shooting, and being paired with Dan Boyle for defense certainly isn’t helping. Photo courtesy of MSG Photos. The bottom line is the Rangers’ best players need to be better. Yes Nash has been a force on the ice, and does a lot of other little things, but the Blueshirts could use his scoring now more than ever. St. Louis is filling in for the missing Mats Zuccarello, and hasn’t done a great job. He doesn’t have the same ability to hold onto the puck and set up plays, something that used to be a huge part of his game. And guys like Yandle and Dan Boyle need to be better as well, both defensively as well as hitting the net with their shots, making life hard for Holtby and creating rebound chances. The Rangers also need to make life harder for Braden Holtby. In this series, he hasn’t had to make a lot of tough saves. He’s been good, but the Rangers have not gotten a lot of traffic in front of him, have not made him move laterally, and haven’t been able to get deflections or rebounds. The playoffs are won on dirty goals, because all of the “cute” passing plays don’t work as well against better teams. It’s time to start digging for dirty goals, start getting traffic in front and tracking the loose puck. There is no reason for the Rangers to be discouraged, and that didn’t seem to be the attitude in the locker room after the practice yesterday. Honestly, they’ve been the better team in all three games. Game 1’s loss can be chalked up to an uncalled penalty, where the Rangers’ skaters stopped playing, and the lone goal in Game 3 was an extremely lucky bounce off of Yandle’s and Lundqvist’s skate. Apart from that, Vigneault’s squad has played pretty strong hockey. They just need to find the back of the net more. Henrik Lundqvist has been spectacular. The defense has been strong. And the offensive has been getting some decent looks. The Rangers are just a few tweaks away from really dominating in the playoffs. Nash and St. Louis are close to breaking through, but now it’s time to get it done. The Rangers have been shut out in 10 of the last 15 periods, and there hasn’t been enough open ice or second chances. That needs to change. The Rangers need to come out strong, score the first goal, and never take their foot off of the gas pedal. Keep pressing, because the moment of truth is upon them. The Rangers and the Capitals will face off at the Verizon Center at 7:30 PM. The game will be broadcasted on NBCSN. Posted on May 6, 2015, in Game Previews and tagged Alain Vigneault, Alex Ovechkin, Braden Holtby, Cam Talbot, Carl Hagelin, Chris Kreider, Dan Boyle, Dan Girardi, Derek Stepan, Derick Brassard, Dominic Moore, Hartford Wolf Pack, Henrik Lundqvist, James Sheppard, Jesper Fast, JT Miller, Keith Yandle, Kevin Hayes, Kevin Klein, King Henrik, Madison Square Garden, Marc Staal, Martin St. Louis, Mats Zuccarello, Matt Hunwick, MSG, MSL, New York Rangers, NHL, NHL 2014-2015 Season, NHL Playoffs, Nicklas Backstrom, NY Rangers, NYR, Rangers, Rangers Nation, Rangerstown, Rick Nash, Ryan Bourque, Ryan McDonagh, Stanley Cup Playoffs, Tanner Glass, The Ranger Zone, Washington Capitals. Bookmark the permalink. Leave a comment.